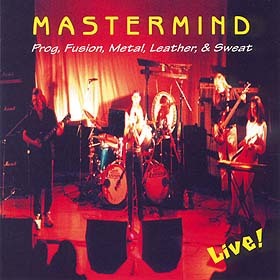 MASTERMIND - Prog, Fusion, Metal, Leather & Sweat - LIVE! Distributed in Japan by Marquee Inc.
© 2001 Bill Berends. ALL RIGHTS RESERVED. 80 minutes total playing time. 12 page booklet with over 75 action packed color photos. Check out this Progressive World review! "one of the most interesting live recordings in the last decade..."
"This disc is great! Great live production & love the pix too!" Read the NEARfest '99 concert review which inspired the title here.